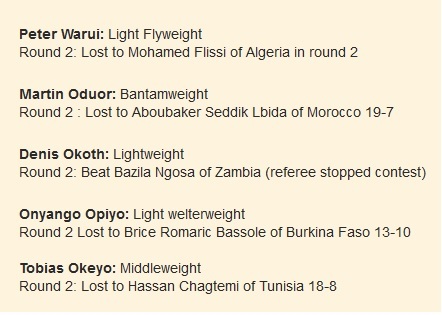 The 2012 Africa boxing championships also served as the African Olympic Qualifier. The tournament was held in Casablanca, Morocco From April 28 to May 5 2012. Each finalist was gien an automatic slot at the 2012 Olympics. Only Benjamin Njagiru Gicharu was able to reach the final and qualify for the Olympics. 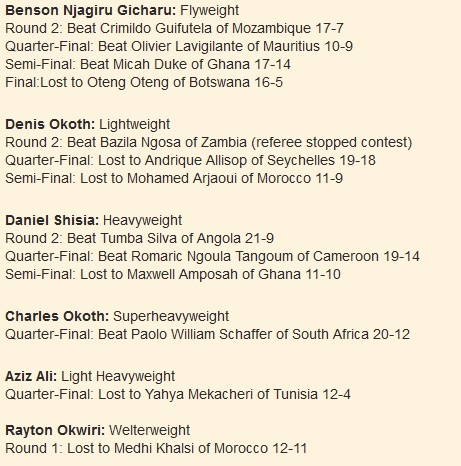 This entry was posted in kenya boxing results, Kenya Sports news and commentary and tagged Aziz Ali, benson gicharu, daniel shisia, dennis okoth, Kenya Boxing Team, Onyango Opiyo, Peter Warui, rayton okwiri, tobias okeyo. Bookmark the permalink.